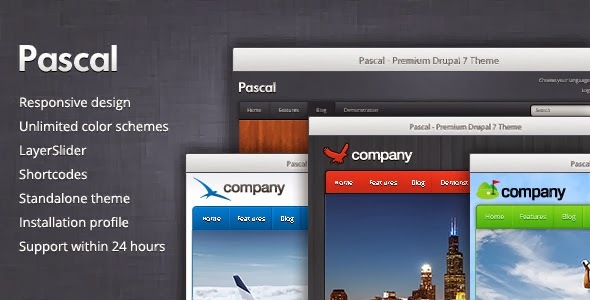 Pascal is a responsive multipurpose theme for Drupal 7. It is responsive, easily customizable and comes with two premium modules – Short codes and LayerSlider. If you want a theme can be easily made unique, choose Pascal. Pascal works with the Color module. You can either use the default color scheme or create a custom one. You can select heading, site name, slogan and body fonts from over 600 Google Web Fonts and 13 web-safe fonts. Change the sidebar alignment and control amount of footer columns. Upload a custom background and toggle the ambient light effect. Details make the difference. Toggle visibility of elements, upload a logo and a favicon and much more. The LayerSlider module helps you to build awesome slideshows. Upload an image, drag it to the right place, select effects and you’re ready to go! Each slider you create will be available as a block so it can be placed into any region in the theme. LayerSlider supports HTML, images, text and videos. The Shortcodes module adds a shortcode filter to your site. With shortcodes you can easily insert slideshows, maps, buttons and other elements. The module thinks for you – for instance, when embedding a map, all you need to know is the address. No more hassle with HTML and complicated embed codes. You can use the standalone theme to upgrade an existing website. In addition to the theme, you can install the two premium modules Pascal ships with. Installation profile can be used to kickstart a new website. It comes with all the essential modules such as Views and Webform and follows stable module only policy. SQL Dump is a 100% copy of the Live Preview site. You can use it to learn how things are done in Pascal or use it as a base for your own website. Item Reviewed: New Multipurpose Responsive Drupal 7 Theme 9 out of 10 based on 10 ratings. 9 user reviews.